Gearbox Teases Borderlands 3 Again – Just Say It Already! We are T Minus two weeks away from Gearbox’s panel at PAX East on March 28th. For the past few days, Gearbox has been leaving behind breadcrumbs of teasers leading up to the event. On Twitter, they posted an Borderlands-style image of a billboard with the date March 28th on it. The next day, they posted another image of a robot on an operating table for a game which we cannot identify. 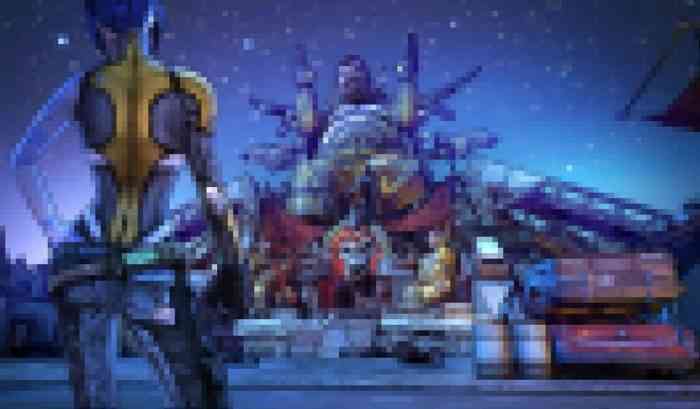 Yesterday, Gearbox tweeted a pixelated image stopping just short of announcing it by name: Borderlands 3. At this point, we all know it’s coming. Do we really have to wait until PAX East? Don’t wait for the image to load properly; it won’t. The picture shows a playable character from Borderlands 2 Maya the Siren from behind. She is standing in front of what appears to be a settlement or a shop. The location does not appear to be from any of the previous games (to the best of my recollection), so that would suggest something new. What’s with the blurriness of the image? My guess is that so Gearbox can continue saying that it is not confirmed to be Borderlands 3. No one can say for sure that it is Borderlands 3 with the exception of anyone who has seen or played any of the previous games, which is pretty much everyone. As mentioned above, Gearbox is hosting a panel at PAX East later this month. They are expected to announce Borderlands 3, possibly another game from which that operating table robot is from, and maybe something else. We will have to wait and see. Will you be paying attention to the Gearbox panel? Let us know in the comments below.